Specifications: Features vary by model. A luxurious presentation for your iProducts. Haute couture is a French term reserved for clothing of the finest craftsmanship, most exclusive materials, and one-off custom-fitted design. In this world beads are often jewels, and threads are commonly made of real gold and silver. I can speak to this directly, as my wife studied at the Haute Couture House of Lesage, in Paris, France. I myself, have held a dress valued at nearly half a million dollars. But one question has since beseeched an answer: when draped in such a work of art, how does one dress their electronics to match? Noreve Saint-Tropez elegantly presents the answer in their line of Haute Couture cases for mobile devices. 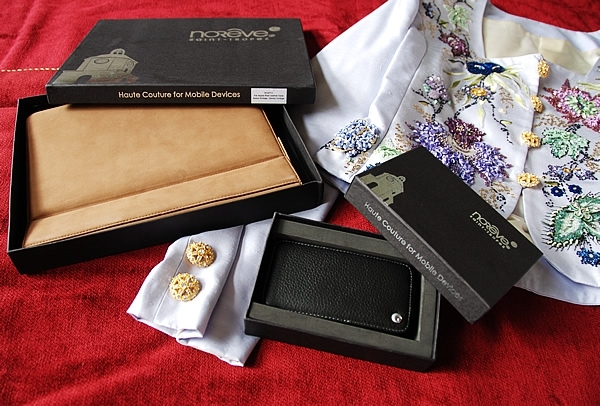 Noreve luxury leather cases offer a solution that is bespoke of class and style. The cases were shipped in boutique feeling black boxes with a silver embossed logo and image of the famous Church of Saint-Tropez. Upon opening the boxes the pleasant and luxurious scent of new leather tickled the nose, not unlike the scent sensation that encompasses you while seating yourself in a brand new Bentley GT Coupé...so I am told. Let's face it; if you're an iPad or an iPhone, it's been darn hard to find a nice outfit, and one that fits properly! Noreve aims to solve this problem with a full line of cases for the iProducts and all those other phones everyone uses; though I didn't see a case for my VERTU Constellation Pure, or Ulysse Nardin "Chairman" - oh couture indeed! 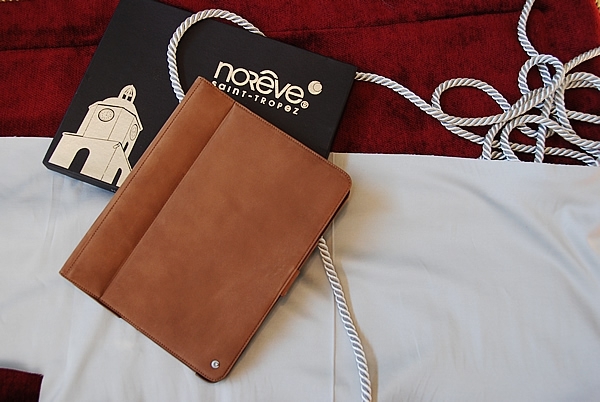 Noreve has several options for your choosing including the type and color of the leather. For the iPhone 3G, I was sent a black Tradition case from their Ambition Selection. The Ambition Selection is a high quality pebble grained leather with a - more or less, matt finish. Figure 1: Case and Point. For the iPad, I was sent a Tradition case from their Exceptional Selection in the Sandy Vintage - or café au lait shade, if you like. The Exceptional Selection leather is a suede that undergoes a special tanning process to preserve its natural characteristics. Oils are then applied to give the leather an extra smooth and weathered finish. Figure 2: A case you could cuddle with. While I especially liked the weathered look on the iPad case, both leathers were soft, supple, and luxurious to the touch. They both appeal to one's desire to hold them and keep them close. I am not sure I have ever wanted to hold my iPad so much as when it wore the case, but I digress. 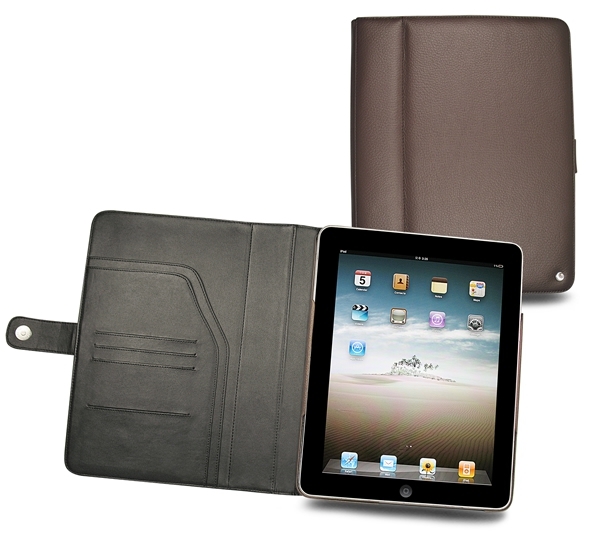 The iPad Tradition is a leather portfolio-style case that is secured with a magnetic button closure. Inside, the Tradition case has pockets for business cards and small papers or pamphlets. Figure 3: A case that frames the iPad well. But the piece de resistance is the way in which the case holds onto the iPad itself. Most iPad cases involve a bezel/sleeve to retain the device; some have elastic straps. I find both solutions unattractive. Here, though, the iPad is held in place with unobtrusive form-fitting handles, and friction. 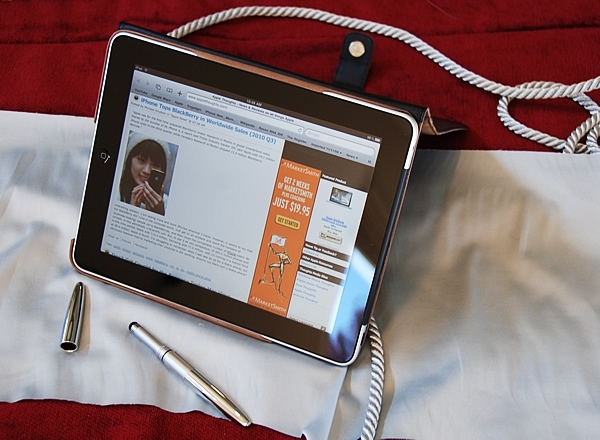 The Noreve solution allows the iPad to be displayed in its grandeur while tightly and neatly holding the iPad in place. The fit is superb, and a leather edged iPad - well my friend, that is divine. 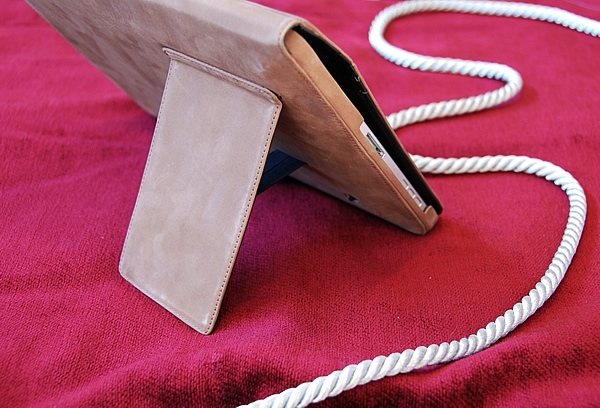 On the back is a stiff leather flap that acts as a stand for using the iPad in landscape mode on a hard surface. It is secured to the case with a ballistic ribbon and two plastic snaps that require some force to release. When fastened, the flap tucks flat, and neatly away acting as a natural part of the case itself. All in all, the iPad Tradition case is a sumptuous solution begging to be caressed. It carries like an important book, and feels significant in hand. To arrive with an iPad in this case is to make an entrance. Figure 5: Wrapping the iPhone in leather. The iPhone 3G Tradition case is a clamshell styled case with a snap closure. The lid wraps the phone from bottom to top, providing adequate protection for the screen while inside a European Men's Carry-All, or while on a belt; I use a belt, not that there's anything wrong with the purse. Inside there is a pocket for business cards, making good use of the lid. The iPhone is held with friction by two handles on each side of the case, just as the iPad was - if not as securely. The design leaves some exposure to the corners of the phone, but ultimately provides good business-environment protection. Included with the case is a plastic belt clip with 360 degrees of rotation and a push button release. As with the iPad case, this case was a pleasure to hold and introduced an upscale feel to the iPhone. Did I mention I like to hold this case? I could cuddle with it. Unfortunately that doesn't exactly mean it is best suited for the way I use the iPad. I prefer to use the iPad while lounging on the couch, and in landscape mode. This means that I have to fold back the lid and manage the flap, button closure, and side to side movement they all present. If setting on a table, the rear flap can be deployed. But the options for adjustment are two; deployed or closed, and this can mean uncomfortable angles. The fit of the case is very good. The closure is tight, which can sometimes mean fastening the button can be challenging; but that is a good thing. The fit was a bit too good though, for the synch/charging cable. To connect it, I had to push down on the case a little and wiggle the adapter into place. (For what it's worth, I have seen some give appear over time, as the leather has apparently been stretching.) Close fitting has also made the Mute switch and Volume rocker harder to access, now requiring fingernail use. Look, if you buy a Bentley Continental GT, the gas mileage, new tires, or maintenance fees shouldn't upset you. You buy it for the style, speed, and luxury. The same is true for the Noreve Tradition luxury case for the iPad. It has an understated elegance that says high class and old money. While it may lack some rather pedestrian utility, you'll quickly overlook that for the opportunity to show it off. This case feels and looks so good that I just want to carry my iPad with me everywhere I go. Now, if only the Tradition case had a holder for my Hard Candy Cases iPad Stylus, we'd have a match made in heaven. The Tradition case for the iPhone 3G ships configured to be used in hand and in pocket. 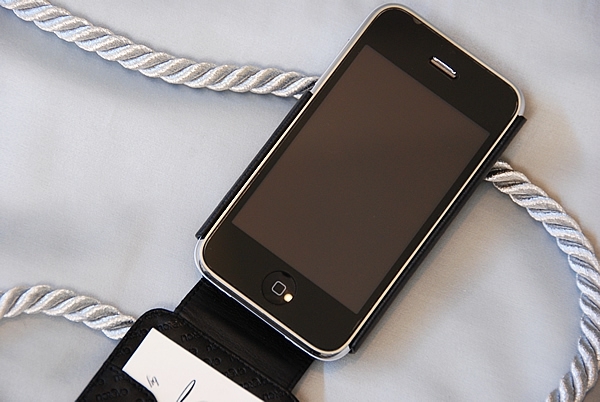 I like to hang phones off of my belt, and for users like me, there is an included belt clip (some assembly required). In order to use the belt clip you are required to remove the button on the back of the case, and replace it with the clip stud. 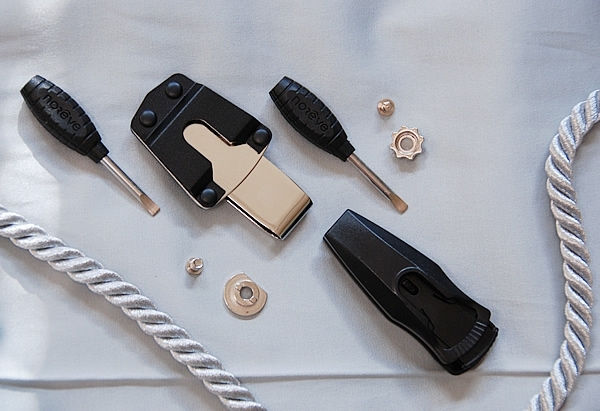 Conveniently, Noreve ships the kit with a significant little screwdriver. The belt clip is centered vertically on the back of the case, and allows for 360-degree movement in eight stops. While I was able to tightly fasten the stud, I found that in use, it loosened a bit. It still hasn't come loose, or, worked its way off, but the movement left me feeling uneasy. The clip itself is low profile, and has a push button release on top to release the phone. The clip was surprisingly long enough for me to use with my dress and casual belts (a complaint with many others) and has a hook end providing additional security while in use. Figure 6: Two clip or not to clip. 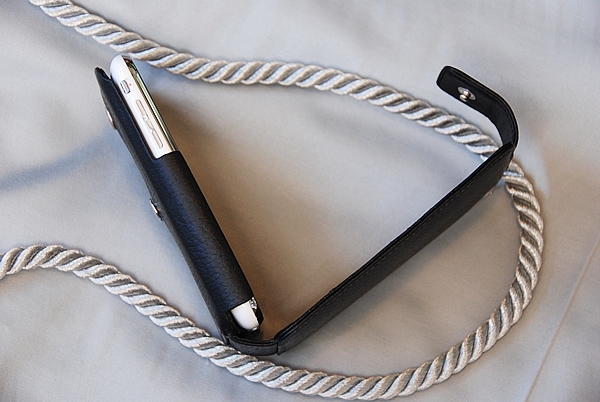 Noreve also sent me their Metal Belt Clip System. In contrast to the plastic clip included with the Tradition case, the metal belt clip system is industrialized; heavy duty. The clip is solid feeling, with some heft, and comes with a larger clip stud, longer screw, and the signature Noreve screwdriver. The design allows for uninhibited movement in 360 degrees, however, is made to slide out at the top of that stroke. I am not sure why they designed it this way; in fact I am quite perplexed. I found when wearing this clip that I was constantly reaching for my phone to see if it was still there. On a couple of occasions the phone found its way out on its own; usually while driving. This problem greatly disappointed me, as I very much preferred the metal clip to the included plastic one. Sadly, despite the superiority of its build quality, slim profile, and solid feel, it just couldn't accomplish its main task; keeping my phone on my belt. 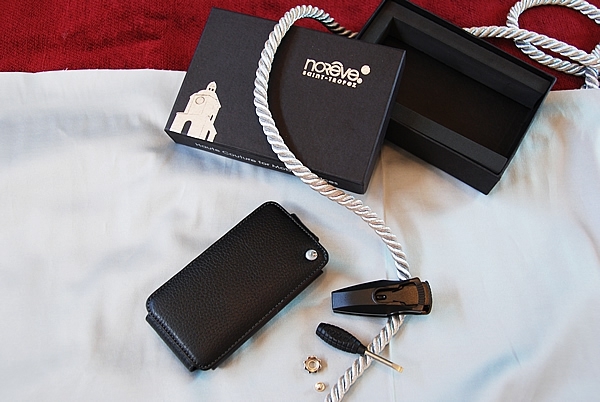 Figure 7: The Noreve iPhone Tradition case keeps a low profile. As mentioned above, the lid of the case has a metal snap closure. I looked forward to this feature adding more security than the Vaja ivolution Top case I have. Unfortunately, it did not. I found the lid would, by its own devices, release when wearing a coat or sweater while driving. You see, as the case rotates the clip-release-button slides underneath the lid snap. Any movement perpendicular to the snap releases the lid, exposing the phone screen and leaving the lid dangling about. Though this issue never sacrificed my phone to the pavement gods (as the Vaja case did), it didn't make me feel comfortable wearing it on my belt. I feel the snap is a good idea in need of better execution, and I look forward to a gen 2 case that resolves these issues. In addition, I feel the need to mention that the fit of the case could be improved. It would be inaccurate to say this case was sloppy, but I must note that the phone does move while in the case. Noticing this, I unsnapped the lid, inverted the case and shook it sharply. As I did this, the phone slid out of the case in small increments until it plopped onto my office chair. While this experiment doesn't mirror real life situations, I'd be happier if the fit was tighter and more secure. I'll also note that my phone never slipped out of the case in all the time I tested it. I can't say that about the Vaja case. Figure 8: Haute couture dresses up mobile cases. Noreve makes a very nice case. The leather is soft and supple, and feels great! The two-toned metal logo and the interior details offer more style and utility than most cases. And while it's fair to say that these cases fit well into the luxury case category, proclaiming these cases as haute couture may be a bit of a stretch. The materials may qualify, but the workmanship lacks some of the passion that went into the design and marketing. The features are rich, but miss perfection due to minor usage flaws and considerations. In the end, though, Noreve cases provide a good value in terms of price and product, and owning a case of this caliber will surely put you in distinguished company.